This past week I spoke at two brown bags and I'm speaking at another one this Friday. In two of them I spoke about Croatia to the staff of the Corporate Controller and I think they liked my talk and I hope I was a good ambassador of my country, especially as some attendees told me after the presentation they would like to go visit Croatia. I spoke about, I think, unusual things, like what coffee means in the life of a typical Croat, the secrets of lace-making from the island of Pag, the lighthouses, the sunsets, the wooden toys, the Dalmatians, Zinfandel and those beautiful Chicagoan Indians on Horseback by Mestrovic, to mention just a few. 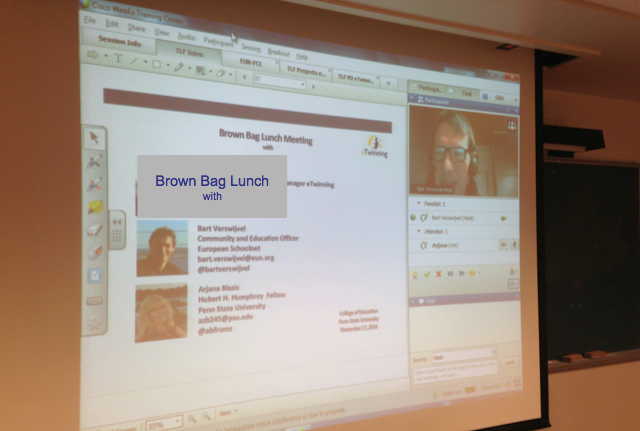 In today's brown bag for the Teacher Leadership Faculty I co-presented with Bart Verswijvel, Education and Communications Officer from the European Schoolnet in Brussels. He joined us via Webex and was so kind to stay with us during the whole session, even though, unlike us, he didn't get a brown bag. Bart and I talked about the eTwinning network and how teachers are using it to launch projects, connect with their peers and develop professionally. 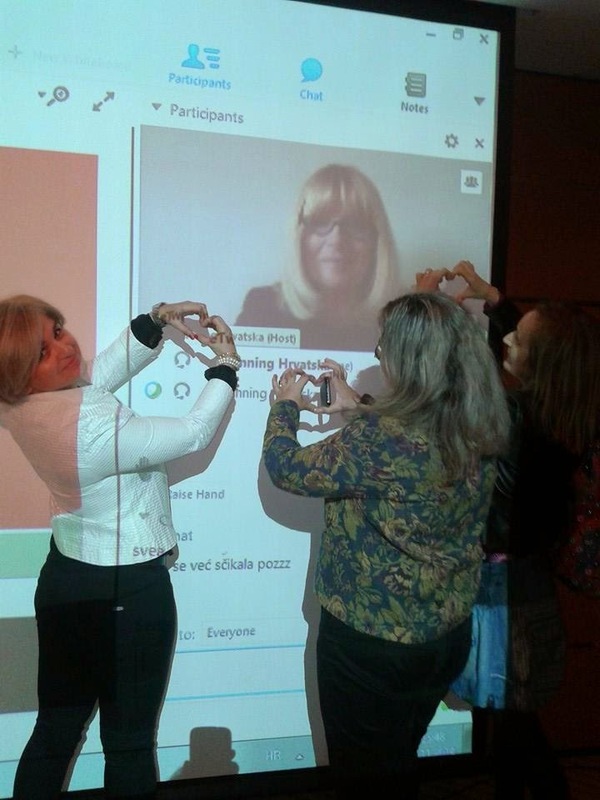 I also gave two webinars for Croatian eTwinning teachers. It was wonderful to speak to so many enthusiastic teachers who wanted to learn more about Lifelong Learning on the eTwinning network and the Skills of the 21st Century. 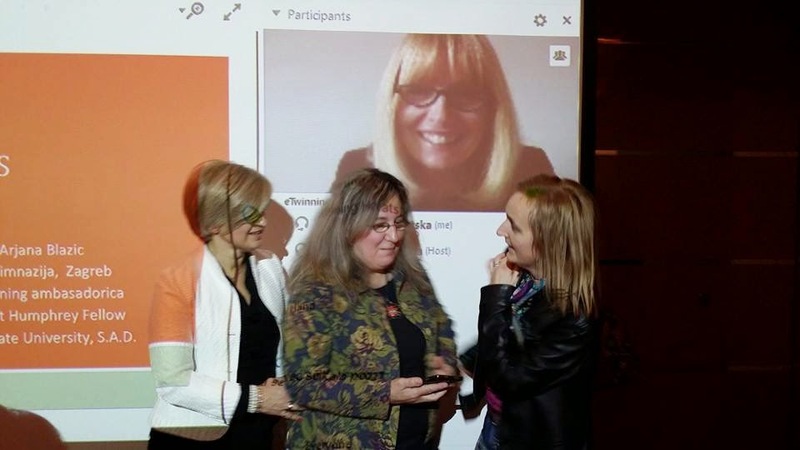 Those were the first two of the three webinars that I'm leading as a Croatian eTwinning ambassador in November. 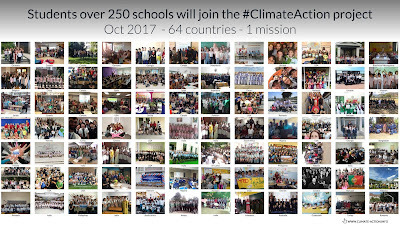 The most emotional and the most cherished moment of the past week was about eTwinning again: I won the first prize for my last year's eTwinning project Coursera Kids in the national eTwinning awards competition. My project partner from Greece, Lina Kalliontzi, also won the first prize in the same competition in Greece! So this must mean that the project was really great! What we did was rather unique. We enrolled our students in a Coursera MOOC and guided them through this fast-paced course. 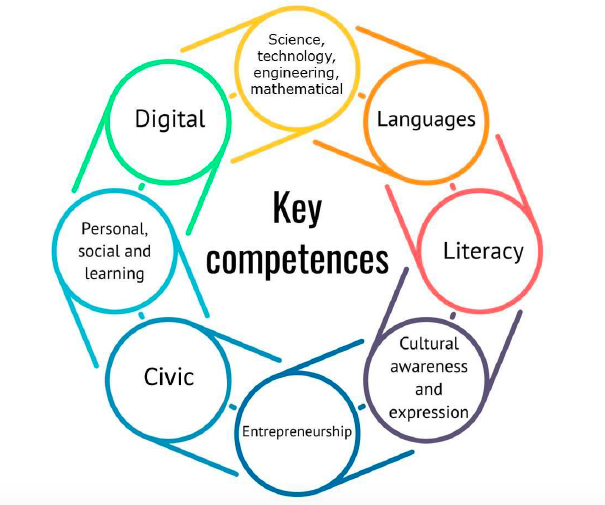 The MOOC was in fact a project within an eTwinning project, which enabled the students to learn more thoroughly, more slowly and more creatively how to develop their writing skills and get ready for their school-leaving exams. 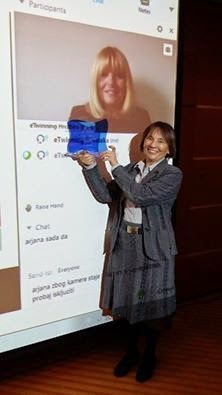 The Prize ceremony was held in Zagreb and I "Webexed" in to give a short presentation about the project. My headteacher, Ms. Svea Bielen was there to receive the award and take it to my school and to my students. There were also my dear friends Ivana, Suzana and Natasa. I couldn't see what they were doing, but I could hear them and I knew they were up to something fun.